Dozens of Palestinians have been injured, Tuesday, during clashes with Israeli soldiers invading communities in the northern West Bank district of Tulkarem, and the central West Bank district of Ramallah. The Palestine TV has reported that the soldiers, stationed near the Annexation Wall Gate, west of Shweika area, north of Tulkarem, fired dozens of gas bombs and rubber-coated steel bullets, at hundreds of Palestinians, marching against the ongoing Israeli violations, and escalation. A Palestinian activist, identified as Khaled Mansour, was shot with two rubber-coated steel bullets in his leg and abdomen, and Mirvat Abu Shanab, secretary of Palestinian Democratic Union, was shot in her leg, while scores of residents suffered the effects of tear gas inhalation. The procession started in front of the Red Cross in Tulkarem, after the residents held a protest in front of the building in solidarity with the political prisoners, held by Israel, and against the escalating violations and crimes. Many international activists also participated in the protest, also expressing their rejection to Israel's construction and expansion of its illegal colonies in occupied Palestine. 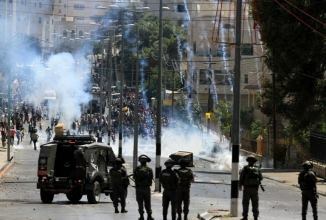 In related news, scores of residents suffered the effects of tear gas inhalation, after the soldiers assaulted a procession that took off from Betunia town, near Ramallah, heading towards the Ofer Israeli Prison. Eyewitnesses said the soldiers used excessive force, and fired dozens of gas bombs on the protesters. In addition, soldiers kidnapped Omar al-Farouq Nasser Obeydiyya, a teaching assistance of the Physics Department in Birzeit University, in the Ramallah district, after violently assaulting him, causing various cuts and bruises. Israeli soldiers invaded, Tuesday, various villages and towns in the southern West Bank district of Hebron, wounded several Palestinians, including schoolchildren, and kidnapped two residents. Schools in Surif town near Hebron, had to shut down due to ongoing invasions, and gas bombs fired by the soldiers. Mohammad Awad, spokesperson of the Popular Committee against the Wall and Settlements in Beit Ummar, north of Hebron, said the soldiers invaded the town, and clashed with local youths in the Safa Junction area. The soldiers fired several rubber-coated steel bullets and gas bombs on the protesters, wounding four Palestinians, while many others suffered the effects of tear gas inhalation. 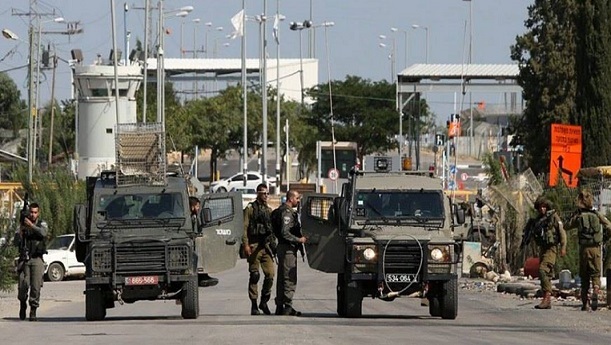 The soldiers also placed sand barriers on the southern entrance of Bani Neim town, east of Hebron, and closed the iron gate of the main entrance of Doura town, in addition to installing a military roadblock closing the al-Fawwar refugee camp. In addition, the army fired gas bombs into schools’ grounds, and kidnapped two Palestinians, identified as Marwan Mohammad Abu Fara, 35, and Mohammad Hazem Ehdoush, 18, before withdrawing. Clashes took place between the invading soldiers and local youngsters, who hurled stones and empty bottles on them, while the army fired live rounds, rubber-coated steel bullets and gas bombs. Many Palestinians suffered the effects of tear gas inhalation. In related news, soldiers stationed on the al-Jalama roadblock, northeast of the northern West Bank city of Jenin, kidnapped a Palestinian child identified as Jamal al-Mohr, 16 years, and took him to an unknown destination. Another Palestinian, identified as Saed Emad Mohammad Sleibi, 19, was kidnapped on the Jaba’ military roadblock, near Jenin, while heading to work. Sleibi is a former political prisoner. Medical sources have reported, Monday, that eight Palestinians were shot with live Israeli army fire, during clashes with soldiers invading Qotna village, northwest of Jerusalem, following the funeral procession of two young slain Palestinians. 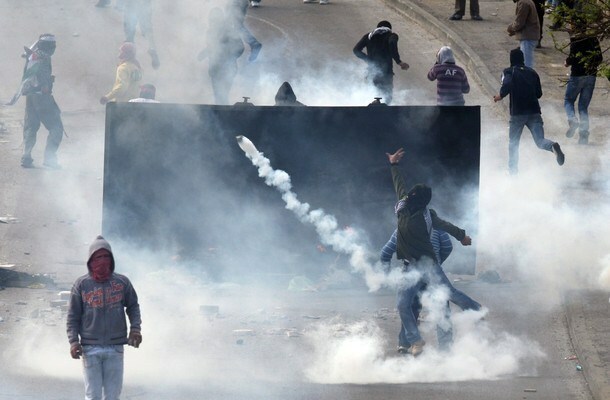 The clashes took place following the funeral ceremony of Mohammad Shamasna, 23, and Omar al-Faqeeh, 25. Al-Faqeeh, was killed on October 17, after the army alleged he "attempted to stab a soldier" in the Qalandia terminal, north of Jerusalem. The Israeli army refused to transfer the remains of the two slain Palestinians, until Monday, November 2. Extensive clashes also took place close to the "Radar" illegal Israeli colonialist outpost, built on privately-own Palestinian lands belonging to the villagers. Thousands of Palestinians participated in the funeral ceremony and procession, starting from Hamza Mosque heading towards the village’s graveyard. Violent clashes broke out at dawn Tuesday between Palestinian young men and Israeli soldiers after the latter escorted scores of Jewish settlers to Joseph's tomb on the eastern side of Nablus city at the pretext of making repairs. Eyewitnesses told the Palestinian Information Center (PIC) that large cargo vehicles carrying construction materials and passenger buses escorted by military troops arrived at the mausoleum of Joseph at an early hour in the morning. 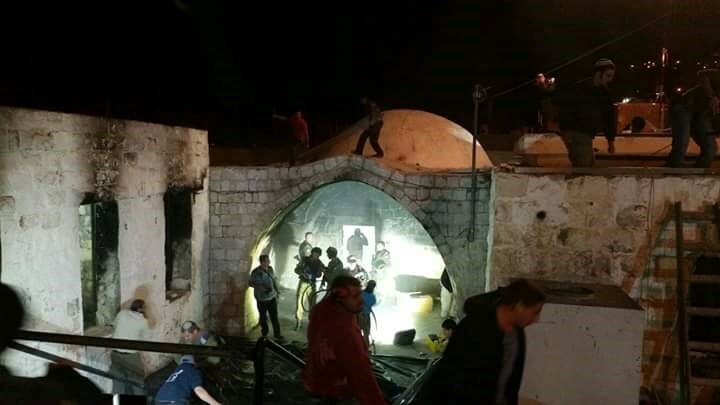 They reported seeing dozens of workmen embarking on repairing the fire damage at the mausoleum, which was attacked recently by angry local young men reacting to Israel's escalation of its violations against the Aqsa Mosque. They added that a large number of Jewish rabbis and settlers were present at the site. The unwelcome presence of Israeli troops and settlers in the city raised the ire of local young men and provoked clashes with them in different areas, particularly in Balata refugee camp and Amman street. In a separate incident, the Israeli occupation forces kidnapped at dawn today two Palestinians during a campaign in Nablus and two others at Za'atara military checkpoint, south of the city. A number of Palestinian youths were injured Tuesday morning as clashes broke out in Beit Ummar and Surif towns north of al-Khalil. 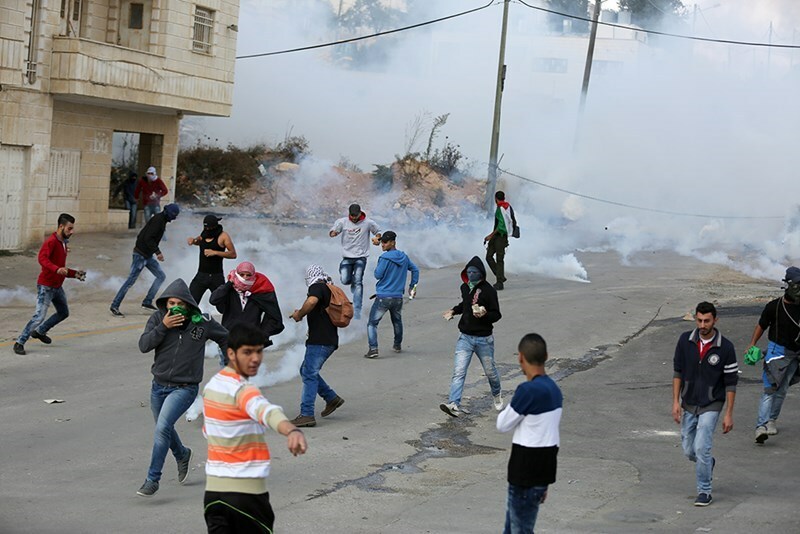 Local sources affirmed that the clashes broke out when Israeli occupation forces violently stormed Beit Ummar town amid heavy fire of tear gas bombs and rubber bullets. 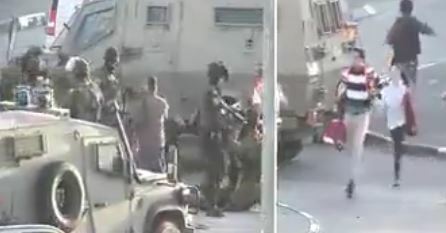 Dozens of injuries were reported during the clashes. Similar confrontations erupted at dawn today in the neighboring town of Surif as Israeli forces broke into the town and opened fire at local residents. At least one young man suffered rubber bullet injuries while dozens others suffered from tear gas inhalation. Meanwhile, the IOF tightened its restrictions at the northern entrances to the city where make-shift checkpoints were erected throughout the neighboring towns and main streets. Along the same line, a Palestinian young man was detained at Jalama checkpoint near Jenin for allegedly planning a stabbing attack. Israeli media sources claimed that a knife was found in his possession. Three Palestinian youths were executed at Jalama checkpoint over the past few days under the pretext of allegedly trying to stab Israeli soldiers. Despite Israeli claims of a widespread wave of ‘knife attacks’ by Palestinians against Israelis, many of the alleged knife attacks were later disproved by video evidence and eyewitness accounts. There have also been several proven incidents of Israeli soldiers placing knives on the bodies of Palestinians they had killed. A Palestinian citizen sustained wounds afternoon Monday in a wave of violent confrontations with the Israeli occupation patrols in eastern al-Bureij refugee camp, in central Gaza Strip. Over recent weeks, violent clashes with the heavily-armed occupation soldiers have rocked eastern al-Bureij refugee camp, leaving scores of Palestinian civilians, including children, severely wounded. Several Palestinian young men on Monday evening suffered injuries during violent clashes with the Israeli occupation forces (IOF) in different areas of Jenin and al-Khalil. Local sources said that Israeli soldiers attacked last night young men with tear gas and rubber bullets in Silat al-Harithiya and Zububa towns, west of Jenin, causing many of them to suffer from suffocation. The Israeli occupation army also invaded several towns near Jenin, including Qabatiya town in the south, and patrolled their neighborhoods, with no reported arrests. Earlier, similar clashes broke out in the evening between young men and invading troops in Beit Awwa town, west of al-Khalil city, and al-Kassara neighborhood in the city. 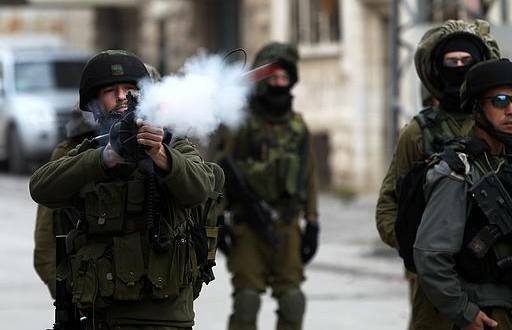 Eyewitnesses reported that the IOF intensively and indiscriminately fired tear gas grenades and rubber bullets at local young men and nearby homes during the confrontations in Beit Awwa and al-Kassara. Many suffered from inhaling tear gas during the events, the eyewitnesses added. There was no information if the IOF campaigns in these areas of al-Khalil ended up with arrests. Dozens of Jerusalemite youths were injured Monday afternoon during violent clashes that broke out near Abu Dis University in occupied Jerusalem. 21 youths suffered rubber bullet injuries while 40 others suffered tear gas inhalation during the clashes, Palestinian medical sources said. During the confrontation, Palestinian youths set fire to tires near the Israeli separation wall and stoned the Israeli military vehicles stationed there. The protesters managed to make a hole in the separation wall before the intervention of Israeli forces who brutally surrounded the area and stormed Abu Dis University amid heavy fire of tear gas bombs and rubber bullets towards the Palestinian students. Israeli navy forces on Monday opened machinegun fire at Palestinian fishermen in Gaza sea. 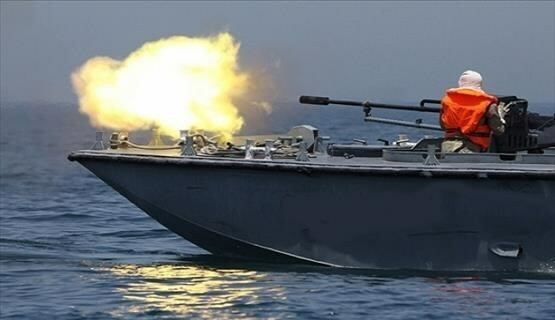 Local sources reported that a number of Israeli navy gunboats fired in the morning hours at the Palestinian fishing boats which were sailing in Gaza sea. The heavy shooting forced the Gazan fishermen to leave the sea and end fishing with no casualties reported, the sources added. Israeli soldiers kidnapped, on Sunday evening, three Palestinians in Silwan and at-Tour towns, in occupied Jerusalem, shot and injured two others. 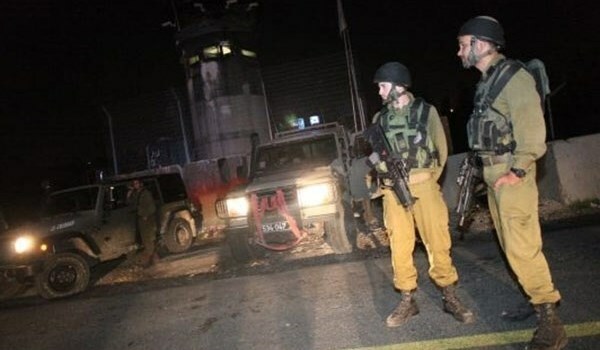 The Wadi Hilweh Information Center in Silwan (Silwanic) has reported that dozens of soldiers invaded the Suwwana neighborhood, and the at-Tour town, east of Jerusalem’s Old City, before kidnapping three Palestinians. Silwanic said the soldiers kidnapped a young man, identified as Qais al-Qmeiry, in Be’er Ayyoub area, after the army attacked a wedding party of a former political prisoner, identified as Ala Sarhan al-Qmeiry, 22. The soldiers hurled several concussion grenades during the invasion. Al-Qmeiry was recently released from an Israeli detention facility, after being imprisoned for 3.5 years since his abduction on May, 28 2012. He was taken prisoner during clashes that took place after the army shot and killed Milad Ayyash, 17, in Silwan. In addition, soldiers kidnapped a child, identified as Yousef Omar Abu al-Hawa, during clashes in the at-Tour town in Jerusalem. Silwanic said the soldiers invaded the town from various directions, and clashed with dozens of local youths, and that the army fired gas bombs on the protesters, and also on a number of homes and shops. Medical sources said a shop owner, identified as Rami and Ghannam, was injured by shrapnel of concussion grenade in the back. In addition, a Palestinian teen, identified as Shadi ِِAbdullah, was kidnapped by Israeli soldiers invading the Suwwana neighborhood. In Addition, resident Mazen Ahmad Abu al-Hummus, 42, was shot with a rubber-coated steel bullet in his face, while sitting in his home in the al-’Eesawiyya town. He was moved to a local hospital for treatment. Member of the Follow-Up Committee in Silwan, Mohammad Abu al-Hummus, said soldiers, police officers and personnel of the revenue department, stormed and searched several shops, and fired rubber-coated bullets targeting residents and a number of homes. Also Sunday, Silwanic said that Israeli soldiers detained two children, only seven and eight years of age, and released them hours later. Silwanic said the children, Yousef Hasan Abi Khdeir, 7, and his cousin, Omar Mohammad Abu Khdeir, 8, while playing in front of their homes in Shu’fat, in occupied Jerusalem. The police said they carried a slingshot, and took them to the police station in Shu’fat, before moving him to their station in Beit Hanina. A large Israeli military force invaded, on Sunday evening, the al-Fawwar refugee camp, south of the southern West Bank city of Hebron. Media sources in Hebron said the soldiers invaded various neighborhoods in the refugee camp, and clashed with local youths who hurled stones and empty bottles on them following the invasion. The soldiers fired live rounds and rubber-coated steel bullets; no injuries were reported. In related news, the soldiers intensified their siege on the Sa’ir town, north of Hebron, after fully sealing all of its entrances, preventing the Palestinians from entering or leaving it. The closure of Sa’ir came after three Israeli soldiers were injured near Beit Einoun Junction, east of Hebron, after a Palestinian vehicle rammed into them. The Israeli military conducted an extensive search campaign, looking for the driver, but could not locate him until he turned himself in to the army at the District Coordination Office. 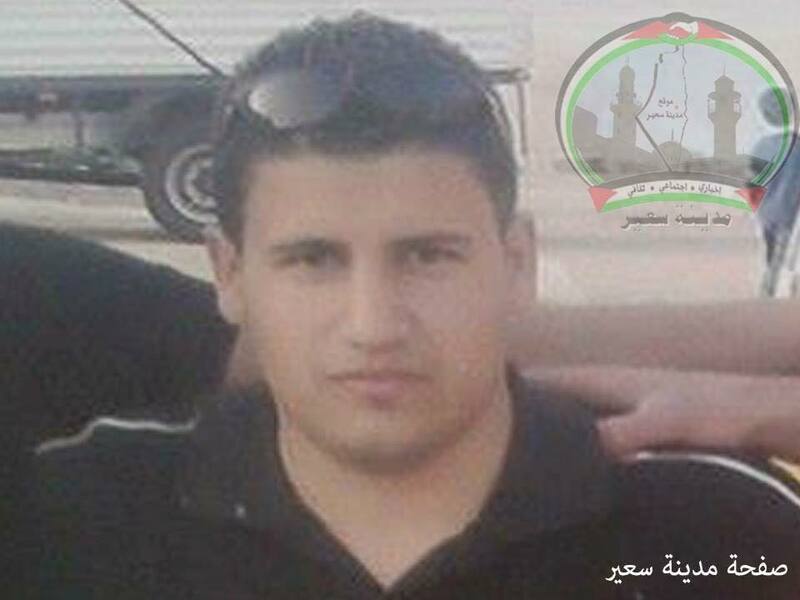 He has been identified as Ahmad Yaqeen al-Ja’fary, 20 years of age. The army moved al-Ja’fary to an interrogation center. This morning at Qurtuba school in al-Khalil (Hebron), Israeli soldiers harassed school-children, teachers and adults trying to pass the nearby checkpoint. The stairs leading to Qurtuba school, the scene of a heinous murder of a Palestinian youth by Israeli forces three days ago, are directly opposite a checkpoint dividing segregated Shuhada Street into a small strip where Palestinian residents are allowed to walk and the former main Palestinian market now completely closed for Palestinians and only allowed for settlers. The school has, due to its proximity to the illegal settlement of Beit Hadassah been a flashpoint of settler attacks and violence against Palestinians and internationals. As teachers, school-children and parents are equally scared with violence rising and 19 Palestinian youth shot to death in the last two weeks, all the school-children are now gathering in one place in order to walk to school together. Parents living there were watching out for the children, telling them to move away from the street as soon as they could hear a car in the distance, afraid settlers would run them over if the children didn’t move fast enough. This has happened in the past and settlers continously try to hit children with their car. Soldiers at the checkpoint denied one Palestinian adult around 30 years old to walk down the stairs. The soldiers stopped him and didn’t even ask for his ID, but ordered him to go back up the stairs and walk around. A group of female teachers and girls were ordered to stop in front of the stairs and made to wait for about 5 minutes. Again, soldiers did not demand any ID or to check bags, and finally allowed the group to pass and go to school after about five minutes. All of this comes at a time, where the whole neighbourhood has been declared a ‘closed military zone’ by the Israeli forces, further infringing on the already restricted movement of Palestinians – while settlers from the illegal settlements are allowed to roam the streets freely. This illustrates the daily harassment Palestinian children and teachers have to face on their way to and from school – a clear infringement on the basic right to education. But this does not only ring true for school-time, harassment and intimidation by soldiers and settlers are increasingly becoming an integral part of day to day life for Palestinians. Israeli forces shot and killed a young Palestinian man in the village of Beit Einoun east of Hebron after an alleged stabbing attempt, Palestinian and Israeli sources said. Also Sunday evening, in Sa'ir town, north of Hebron, three Palestinians were shot with live rounds by Israeli forces and wounded, and taken to Beit Jala government hospital in Bethlehem. A paramedic from the Red Crescent said Israeli forces would not allow their medics to examine the young man. "Israeli soldiers forced us at gunpoint to leave the area," the paramedic said. "From the amount of bleeding, the young man must have been shot several times." A Palestinian witness said that he saw Israeli troops firing several rounds at a "young man" who was "far" from the main street. The witness said the young man fell to the ground before Israeli soldiers surrounded him. Israeli soldiers covered the body with black plastic before taking the body away in a military ambulance to an unknown destination, witnesses said. Witnesses added that Israeli forces also assaulted journalists who tried to come close to scene, forcing them to leave the area. Also on Sunday at dawn, Israeli soldiers invaded Beit Ummar town, north of Hebron, and kidnapped four Palestinians, including two teenagers, during extensive searches of homes and property. The kidnapped have been identified as Yahya Ahmad Sabarna, 25, Ibrahim Khalil Abu Dayya, 25, Malek Bassam at-Teet, 16, and Soheib Khaled Sabarna, 17. All of them are former political prisoners. The death of Fadi brings the total number of Palestinians killed by Israeli forces since the start of last month to 72. 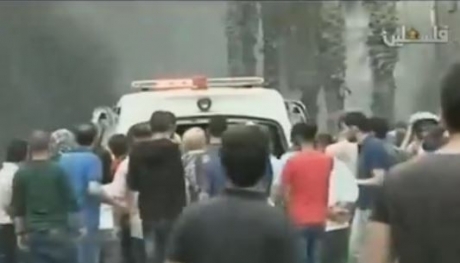 8 Israelis have been killed in attacks by Palestinians during the same time period. On Friday, Qassem Mahmoud Sabaneh was shot dead after an alleged attack on an Israeli border policeman in Nablus, and Ahmad Hamada Qneibi, 23, died from his injuries hours after he was left bleeding on the ground, after allegedly attacking and injuring an Israeli in occupied East Jerusalem (though eyewitnesses have said he did not attack anyone). An eight-month-old Palestinian baby also died Friday after inhaling tear gas when clashes broke out in Beit Fajjar village south of Bethlehem. International leaders have pointed to the decades-long Israeli military occupation as the root cause of the violence, with US Secretary of State John Kerry earlier this week referring to the current situation as "unsustainable." Israeli occupation forces (IOF) executed a Palestinian youth in Sair town to the north of al-Khalil Sunday afternoon. A terse statement for the Palestinian ministry of health said that IOF soldiers fired at a Palestinian young man, north of al-Khalil, and prevented ambulance crews from extending help to him, which led to his martyrdom. 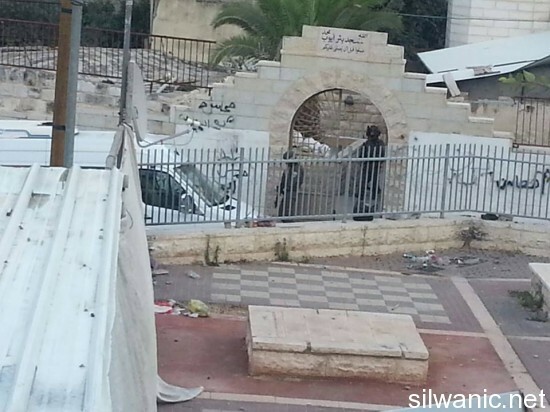 Hebrew media as usual claimed that the youth tried to stab one of the soldiers, which prompted them to shoot him down. However, eyewitnesses on the scene said that the 27-year-old Hassan Farroukh was gunned down while standing in vineyards at the bypass road 60 near the entrance of Sair village. They said that the youth never came near to the soldiers who opened heavy fire at him then left him on the ground bleeding. He did not attempt any stabbing attack, they asserted. 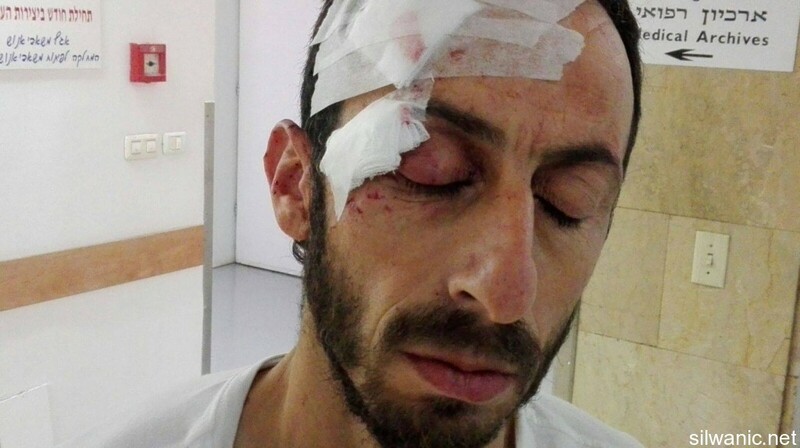 The eyewitnesses said that the soldiers blocked paramedics from approaching Farroukh and stripped him then put him in a black sack and took him away in an Israeli ambulance. The murder of Farroukh brings the number of Palestinian victims of Israeli shoot-to-kill policy to 73 since the start of October. Israeli troops invaded the village of at-Tour, in East Jerusalem, on Sunday, ransacking at least seven homes and abducting five Palestinians. Witnesses explained to the Wadi Hilweh Information Center that Israeli forces deployed in the streets of the village and closed some roads. They were stationed on the main entrances and then raided the area of “Qa’ Al-Hara” and started searching houses and assaulting children; terrifying local residents. On Sunday evening, the Israeli police released two Palestinian children, who were kidnapped earlier in front of their homes in Shu’fat, while the soldiers kidnapped a child in at-Tour town. The two children from Shu’fat were identified as Yousef Hasan Abu Khdeir, 7 and Omar Mohammad Abu Khdeir, the Wadi Hilweh Information Center in Silwan (Silwanic) has reported. The Israeli forces arrested 5 Jerusalemites from the village of at-Tour after raiding several residential houses in the area of “Qa’ Al-Hara” in the village. Among those abducted was a child, identified as Yousef Omar Abu al-Hawa, who was taken during clashes that took place in at-Tour, after the soldiers invaded it. The army fired concussion grenades, gas bombs and rounds of live ammunition. 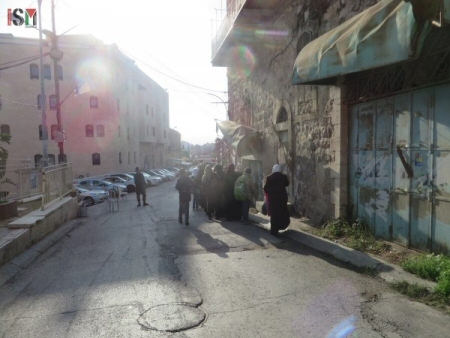 The Silwan Information center reported that the forces raided more than 7 houses for Abulhawa and Al-Sayyad families; some of the houses were empty of residents. The forces searched and caused damage inside the houses and also used police dogs during the search process. Amjad Abu Asab, head of the Jerusalemites detainees and prisoners families committee, explained that the forces arrested Mahdi Abulhawa and his brother Hashem, Ahmad Sider, 60-year old Khalil Abulhawa and his son Omar. Witnesses added that the forces assaulted and beat several young men in the area of “Qa’ Al-Hara”. They claimed that the raid and search operation came under the pretext of someone allegedly throwing an explosive device towards them. No soldiers were wounded and no damage was reported from the alleged 'device'. Israeli troops presented no evidence to support this claim. The attacks in at-Tour village follow multiple invasions of the Al-Makassed hospital, which is located in the village of at-Tour and is the main hospital for Palestinians in the Jerusalem area. During the invasion of the hospital, Israeli troops injured dozens of patients, citizens and employees, who suffered from tear gas inhalation and injuries from rubber bullets. A sit-in was carried out over the weekend at Al-Maqased hospital in response to the continuous raids on the hospital, and also to condemn interrogating doctors and confiscating the surveillance cameras recorder as well as requesting the file of a minor patient who received treatment at the hospital. Several Palestinians suffocated on Sunday, due to inhaling teargas used by the Israeli army against Palestinians, after Israeli soldiers invaded al-Khader town, south of Bethlehem, according to security sources. Many Palestinians injured, north of Bethlehem. Two Palestinians were shot with rubber-coated metal bullets, on Sunday evening, during a protest near the northern entrance of Bethlehem. The Bethlehem branch of Red Crescent Society (RCS) said the two received treatment for their wounds, and many Palestinians suffered the effects of tear gas inhalation. Army forces also clashed with local Palestinians and students outside a school al-Khader. Soldiers used rubber-coated steel rounds, stun grenades and teargas canisters, causing multiple cases of suffocation, according to WAFA Palestinian News & Info Agency. Soldiers also targeted a vehicle belonging to al-Khader municipality with rubber-coated rounds. However, there were no reports of casualties. According to the Ministry of Health, 73 Palestinians have been killed and over 2,270 others injured with live ammunition or rubber-coated steel rounds used by Israeli forces in the West Bank and Gaza since the beginning of unrest in early October 2015. 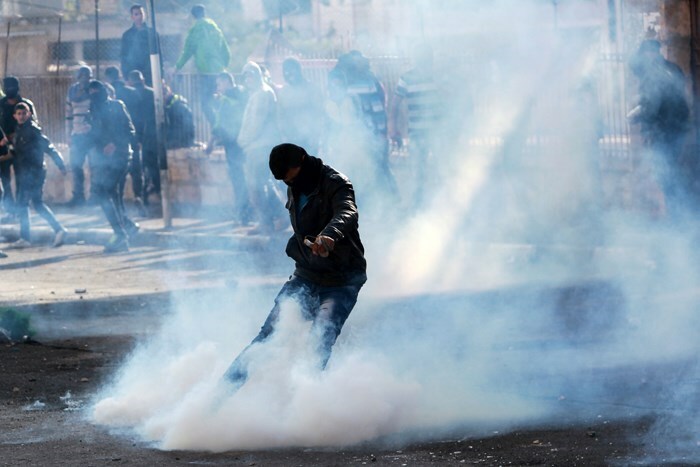 Over 3,000 other Palestinians sustained suffocation due to intensive use of teargas and toxic gas by Israeli forces. Earlier Sunday, A Palestinian was fatally shot by the Israeli army at Beit Anoun junction to the east of Hebron. A Palestinian, whose identity remains unknown until the moment and according to witnesses was nowhere near the scene of the clashes, was shot and left to bleed to death by the Israeli army soldiers, who claimed the Palestinian ran toward them with a knife-wielding hand in an attempt to stab them. Two Palestinian civilians afternoon Sunday were shot and injured by the Israeli occupation patrols in eastern al-Bureij refugee camp, in central Gaza Strip. Spokesperson for the Gaza-based Health Ministry, Ashraf al-Qudra, said a Palestinian citizen was injured in his feet by the Israeli occupation troops in eastern al-Bureij and was rushed to the Suhada al-Aqsa hospital in Deir al-Balah to be treated for the moderate wounds he sustained in the attack. 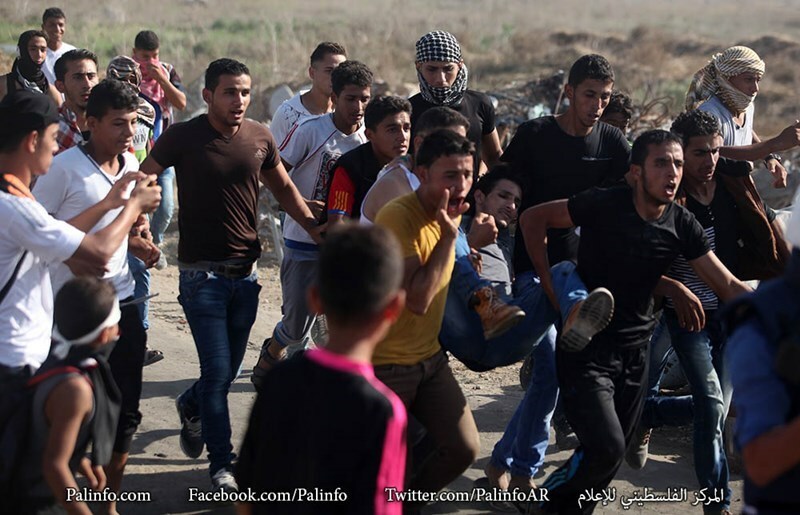 Another Palestinian civilian was also shot and injured in his feet shortly afterwards. According to a PIC news reporter, the Israeli troops deployed near the apartheid fence, separating the blockaded Gaza Strip from 1948 Occupied Palestine, have resorted to excessive use of armed force against Palestinian youths gathering in the area on a quasi-daily basis. At least 17 Palestinian civilians were slain by the Israeli occupation forces and hundreds of others have been left wounded across Gaza’s eastern outskirts since the outbreak of the ongoing anti-occupation intifada on early October. Scores of Palestinian young men suffered from inhaling tear gas during violent clashes on Saturday evening with the Israeli occupation forces (IOF) in Silwad town, northeast of Ramallah city. Local sources said that the skirmishes started at the eastern entrance to Silwad, where the invading troops showered an angry mob of young men with tear gas amid firing of live ammunition and rubber bullets. They added that the troops entered the town and fired another volley of tear gas grenades at Palestinian homes, causing several residents to suffocate.